Congratulations to Harry Strong, CEO of the Canadian Coast Guard Auxiliary and Frank Hudson, President, CCGA-Pacific who received the Golden Jubilee Medal of Queen Elizabeth II. The Golden Jubilee Medal commemorates the fiftieth anniversary of Her Majesty´s reign as Queen of Canada. 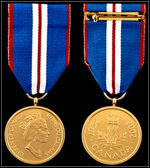 The Medal is awarded to Canadians who have made a significant contribution to their fellow citizens, their community or to Canada.